The SM-G930A and SM-G935A Samsung handsets are currently being tested by AT&T, claims @evleaks. Samsung Galaxy S7 has recently entered the rumor mill and, unfortunately, it looks like it will not launch in time for this year's holiday shopping season. The next-gen flagship is expected to launch next year, most likely in the second quarter. However, some rumors claim it might launch earlier than anticipated. Last week, insiders familiar with this matter revealed that Samsung has begun firmware development for the Galaxy S7. Now, Evan Blass, the leakster also known as @evleaks, posted an interesting message on Twitter. 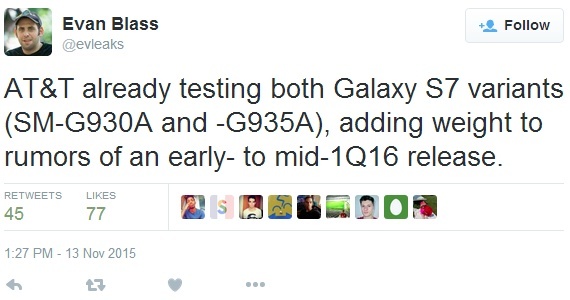 According to him, "AT&T already testing both Galaxy S7 variants (SM-G930A and -G935A), adding weight to rumors of an early- to mid-1Q16 release." The Galaxy Unpacked 2016 event is expected to take place on February 21, one day before MWC 2016 debuts. That might be a bit too soon for the next-gen Samsung Galaxy flagship device but remains to see what happens. The company did not reveal anything about its plans yet, so stay tuned.